Setting up the Nativity is a time honored tradition celebrated by many friends and families - a true sign that the Christmas season has arrived. This inspired Nativity statue gives true reason to celebrate the meaning of the season. This statue set provides details unmatched by other garden statues. Made of polystone, the painted details give this statue its unique and elegant feel. The Holy Family is featured here brilliantly. The characters blend together in this unique take on the classic Nativity Scene. 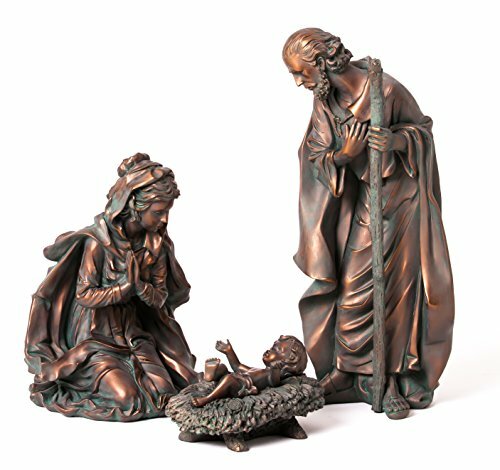 This statue set includes 7 pieces and measures approximately 10.25 x 24.75 x 9 inches. It's weather resistant finish makes it suitable for indoor or outdoor use. If you have any questions about this product by Evergreen Flag & Garden, contact us by completing and submitting the form below. If you are looking for a specif part number, please include it with your message.